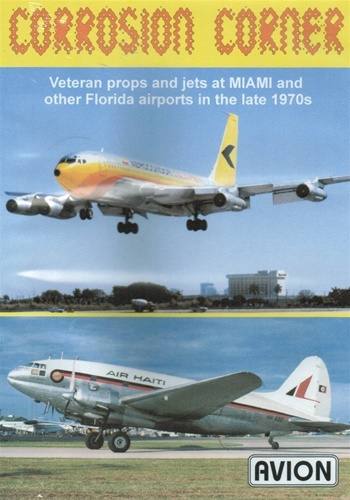 Back in the 1970s and 80s, Miami's Corrosion Corner was famous as the best place to see veteran propliners struggling through their final days alongside some of the earliest jetliners flying freight for carriers now long gone. It must have been amazing, with smoke pouring from vintage jetliners straining to gain height on take-off and tired old propliners resting between cargo trips on oil-covered aprons. Just take Convair 880s, for example. There are five different operators featured: LANICA, Groth Air and Elvis Presley, plus cargo flights by InAir Panama and Monarch Aviation. Early 707s include Southeast's non-fan engined example and a rare Series 100 freighter flown by AeroCondor. The Calder Braniff DC8 appears with others from ARCA, Airlift, ANDES and one in the former livery of Concord International. Big props are certainly not forgotten, as C46s from Casair, Rich, Bahamasair and more arrive to clear customs, along with DC6s of TAN, Cayman, Surinam, CLTM, Electra of LACSA Argentine Navy and TACA. 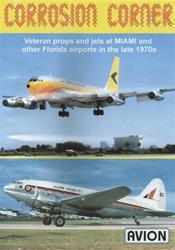 There's a look at Martin 404 operations to Marco island, PBA DC3s at Key West and some of the storied airliners at Fort Lauderdale. Plus flights on an Argo Constellation and an Air Haiti C46, whose Captain switches off one engine in mid-flight! These are just the highlights. In all you'll see 50 vintage jets and 65 big props in this great DVD, made with expertly restored cine film and authentic sound! In NTSC DVD format with runtime of about 53 minutes and region-free.